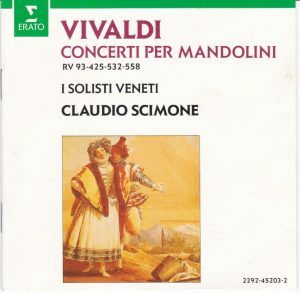 There was a time, in the 1970s, when Claudio Scimone and his Solisti Veneti were, together with ensembles like I Musici or Neville Marriner’s Academy of St. Martin-In-The-Fields, at the cutting edge of Vivaldi interpretation. 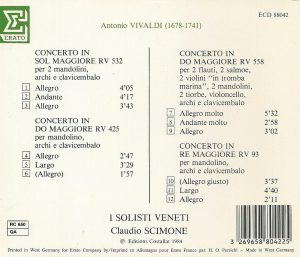 It’s not so much that they played Vivaldi with chamber orchestras rather than large symphony orchestras, because this had been the custom ever since the Vivaldi rediscovery after World War II, championed by such groups as Renato Fasano’s I Virtuosi di Roma or Angelo Ephrikian’s Orchestra della Scuola Veneziana, and, in the 1960s, Antonio Janigro’s I Solisti di Zagreb or Karl Ristenpart’s Saarland Chamber Orchestra. But even those early chamber groups played Vivaldi with thick orchestral textures and oftentimes ponderous tempos and solemn to sentimental expression. So the contribution of those ensembles from the 1970s was to offer leaner textures and more animated tempos, keeping the unique colors of Vivaldi but adding an element of bounce and joyfulness that had been missing earlier. But it is the fate of the cutting-age of one day to be used as a springboard for newcomers and left behind. In the late 1970s and early 1980s came the period-instrument ensembles, led by the Harnoncourts, Pinnocks and Hogwoods, with their leaner-still textures, their more muscular approach, their greater animation, their phrasings in the slow movements that were full of sentiment but devoid of sentimentality. And even them were soon superseded by newer ensembles emerged in the 1990s, often from Italy, like Il Giardino Armonico or L’Europe Galante, with even more energy, more dynamism, more imagination and freedom in their phrasings and ornamentation. 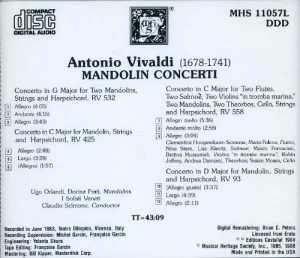 Vivaldi’s Mandolin’s Concertos are a good case in point. Whatever the beauties of the early period-instrument interpretations of these works, either in complete collections like the Parley of Instruments, “Music for Lute and Mandolin” on Hyperion CDA66160, or part of miscellaneous Vivaldi concerto programs like Pinnock’s recording of Concerto RV 558 on Archiv 415 674-2 “Vivaldi Concerti – Alla Rustica” (barcode 028941567420), in 1993 Teldec released a recording of the Pretre Rosso’s complete output for mandolin and/or lute by Il Giardino Armonico (Teldec 4509-91182-2), that established new standards of interpretations and made it hard to go back. For more details on this, see my review. Does it mean then that this recording of I Solisti Veneti has lost any other interest than archaeological? Not entirely so. 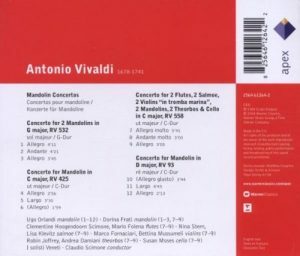 First thing, it is in fact their remake of the concertos, recorded in 1983, with mandolinists Ugo Orlandi and Dorina Frati (she joining him in RV 532 and 558). 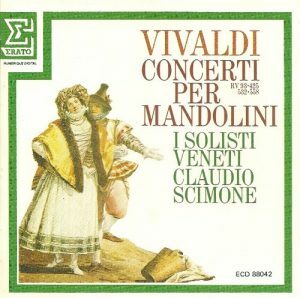 Scimone and ISV had done a previous recording for Erato, in 1969, on LP STU 70545, with mandolinists Bonifacio Bianchi and Alessandro Pitrelli, and only Concertos for 2 mandolins RV 532 (then referred to as P 133), for mandolin RV 425 / P 134 and for multiple instruments including two mandolins RV 558 / P 16 (plus a violin concerto), and it is that version that was first reissued in 1987 on Erato’s budget collection Bonsaï, ECD 55013 (see the review for all the subsequent reissues); besides Scimone, the only performers left from that earlier version are harpsichordist Edoardo Farina and, in RV 558, flautist Clementine Scimone (born Hoogendoorn). But in 1983 they have obviously benefited from listening to the period-instrument interpretations, or they simply participated to the stylistic trend towards leaner textures and more animated tempi. 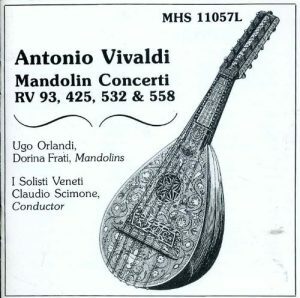 Very typical is the opening Concerto for two mandolins RV 532: when you listen to their former selves, the 1969 recording is, in the outer movements, firmly anchored in those interpretive traditions of the 1960s, a bit too trudging, a bit too thick, a bit to solemn. In the new recording tempos are more sprightly – there is no significant difference compared to Pinnock or The Parley of Instruments – and there is no thickness or heaviness in the textures. And while the earlier slow movement was already very beautiful, in the new version the two mandolinists have added wonderful ornamentation in the repeats. And these observations can be extended to the two other works shared between make and remake. But, in RV 558, a great concerto for 2 flutes, 2 salmoè (an ancestor of the clarinet), 2 “tromba marinas” (instruments of the violin family as the name doesn’t imply), 2 mandolins, 2 theorboes and cello, while more animated than in 1969, I Solisti Veneti’s approach in 1983 remains a very gentle and sweet one, compared to Pinnock’s greater muscularity and energy in 1986, at a tempo that is not significantly faster. But a very nice touch – already present in 1969 – is to have the mandolin trill all his notes in the middle Andante. 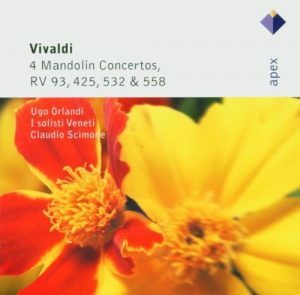 Vivaldi indicates nothing of the sort, but in other versions, when the mandolin just plucks his notes, as they are playing in unisono with the violins, they can hardly be heard. In 1983 the tempo is slightly more animated and the expression less overtly sentimental than in 1969. The Finale is less pedestrian than in 1969 but, in comparison to Pinnock – and I’m not even mentioning at this point Il Giardino Armonico – it does remain pedestrian, gentle and solemn. The difference is even more pronounced in RV 425, and here it is not a matter of tempo. On the manuscript Vivaldi requests that “if possible all the violins should play pizzicato”. In 1969, they don’t (the Parley of Instruments took the same option in 1984). In 1983, they do, and not just in the first movement as Vivaldi’s indication seems to point, but in all three, and you just need to listen to both to immediately realize how much more effective the version in pizzicati sounds: it turns a nice but ordinary concerto into one of Vivaldi’s most sublime inventions. 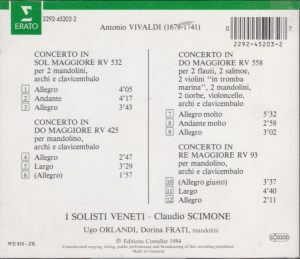 No comparison of I Solisti Veneti now and before is possible of course on the Chamber Concerto RV 93 for two violins, lute and continuo, since they hadn’t recorded that one in 1969. But comparisons can be made with period instrument ensembles, like the Parley of Instruments or Il Giardino Armonico, and it can be remarked that, other than playing with mandolin a work written for lute, I Solisti Veneti do not respect the chamber-concerto character of the composition, turning it into a concerto for mandolin and strings, and also that, again, they play if very gently, with much less verve, dynamism and joy than their competitors. But the middle Largo is beautiful, and with beautiful ornamentation in the repeats. Anyway, whatever beauties contained in Scimone’s 1983 recording, it is no match, in expressivity, invention and joy, for Il Giardino Armonico’s version from a decade later, and neither are most of the competitors I’ve heard in those works (but I haven’t yet heard Fabio Biondi’s 2002 recording, Virgin Veritas 7243 54552724, nor the one by L’Arte Dell’Arco under Federico Guglielmo, Brilliant Classics 93810, barcode 5028421938103, from 2010). Il Giardino Armonico’s recording brought Vivaldi interpretation in another dimension. Teldec also adds two more works, the Trios for lute and violin RV 82 and RV 85, for a TT of 65 minutes compared to Erato’s stingy 44. But Scimone retains an interest for those who’d find Il Giardino too over-the-top, too energetic, too enthusiastic, too imaginative, or those adverse to period-instruments (any such listeners left now?) and who’d want these works gathered on a single disc rather than scattered in collections of miscellaneous concertos, as with Pinnock. I’ll keep it in my collection, but for archival purposes only, to have an overall good version on modern instruments. But for enjoyment I’ll go to Il Giardino. Fine stereo separation between the two mandolins in RV 523, a lot of traffic rumble in the background throughout.